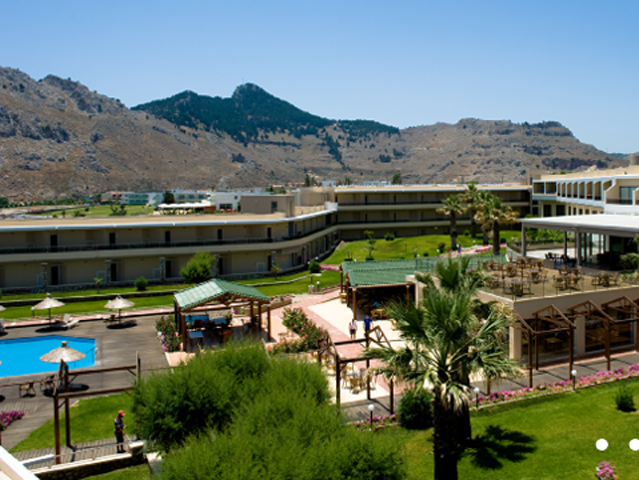 Our hotel is located in the area of Kolymbia, on Rhode's east coast, at about 25 kms south of Rhodes Town, on the direction to Lindos and close to the town of Afandou. 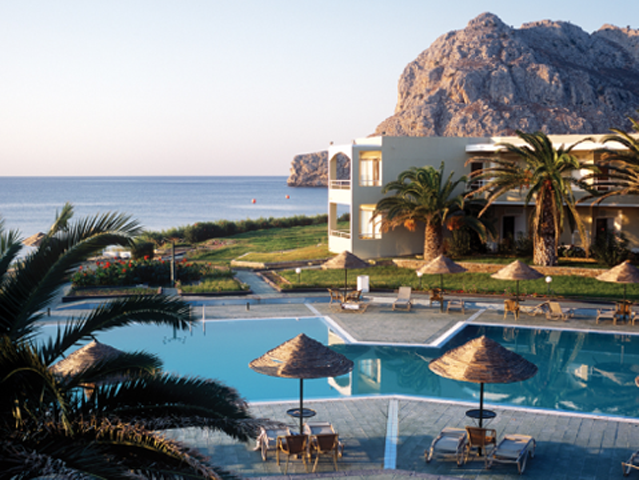 The location is exceptionally convenient, being halfway between Rhodes Town and Lindos, namely on the island's most popular tourist trail. 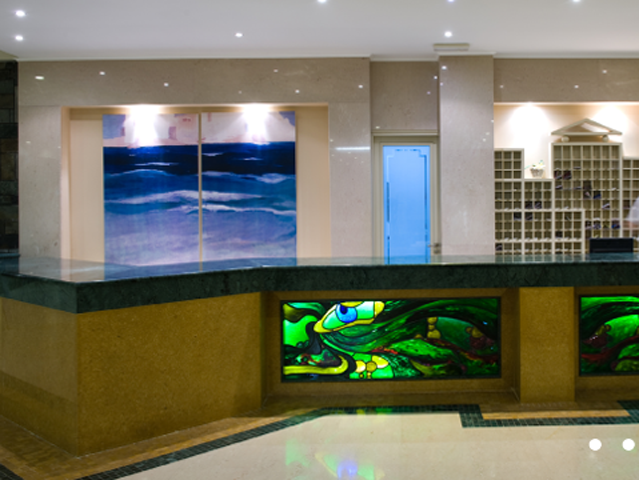 Situated within an idyllic natural environment, the hotel is surrounded by lush greenery and blooming gardens. With the famous Monastery of Panagia Tsambika overlooking the endless pebble beach of Kolymbia Bay above the sharp rock in the background, Lutania Beach Hotel constitutes the ideal choice for perfect vacations! 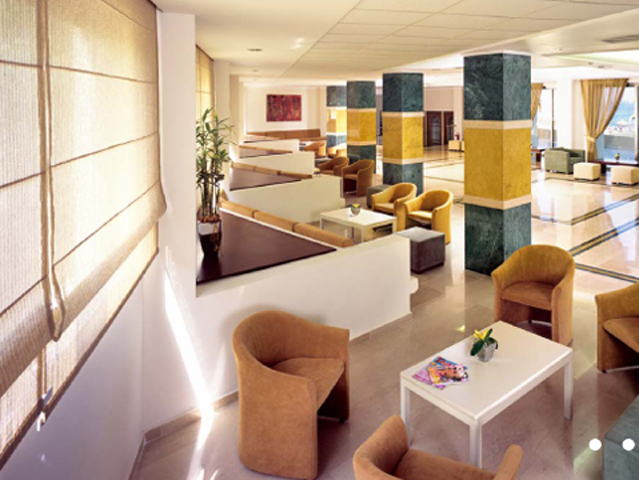 Besides relaxing on the sunbeds on the beach or by the pool, our resort is the ideal starting point for an abundance of activities, covering every “restless” traveler's wide array of interest and hobbies. Within a short walking distance, one can find such activities like water sports, jet-ski and canoe. You can also explore the vicinity of Kolymbia bay on foot or by bike, or go trekking or even hiking on Tsambika's hill and even set off for excursions to the island's mountainous and thickly forested interior by car and hence, simply indulge in the history and the natural beauty of the area which serves as an ideal alternative during the hot summer season. 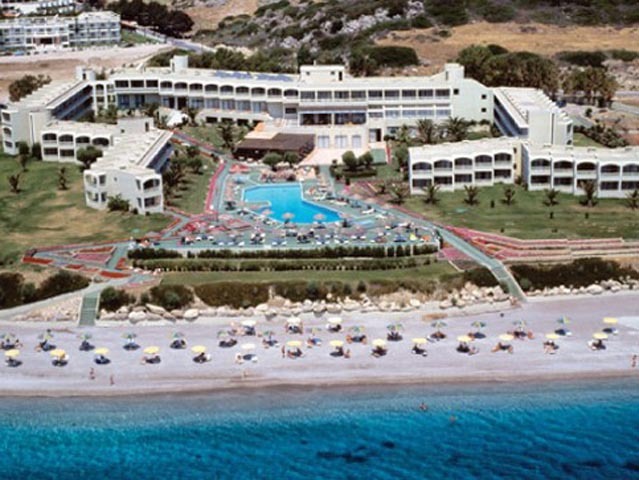 Even more so, the famous Afandou Golf course, one of the oldest and most famous in Greece, is located just under 4 kms to the north, by the huge homonymous beach. In contrast, the swimming pool area allows for an unhindered 180o view towards the sea, giving the impression of becoming part of the horizon itself. 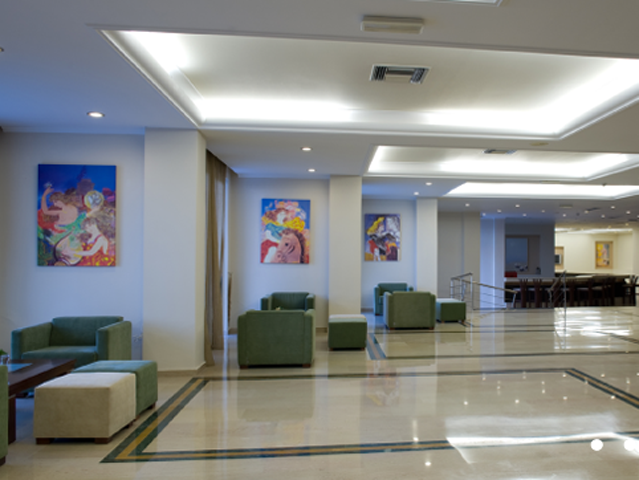 It is a place inspiring relaxation not only during daytime but especially also during sunset and beyond. 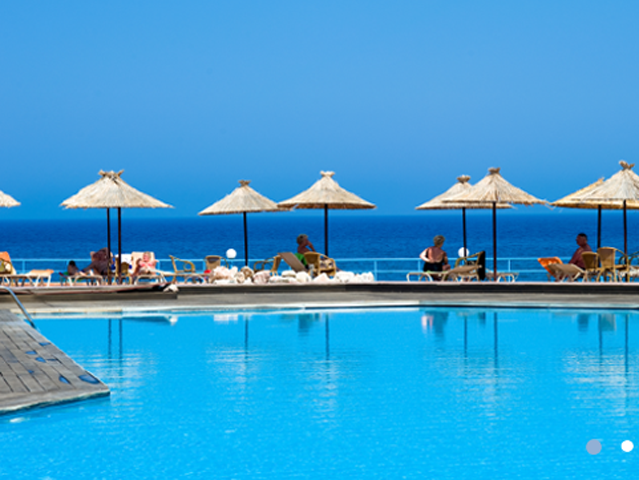 In daylight, sun beds provide the most comfortable way to catch the sun, while in the evening, as sun sets and the horizon wears its deep bluish purple gown, you can sip exotic cocktails and enjoy the breathtaking view towards the endless sea. All beds are double beds. 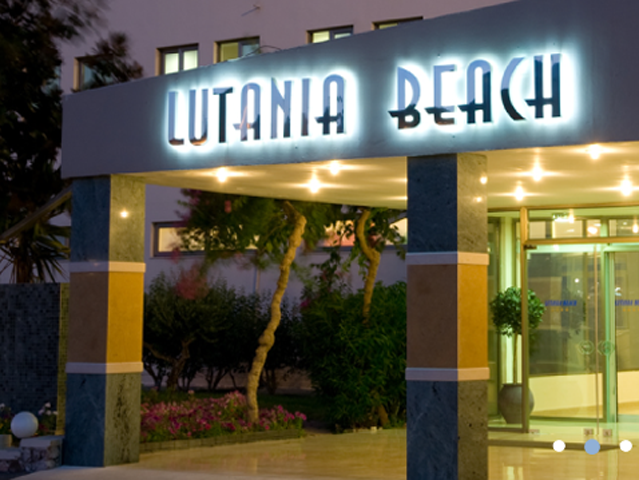 Lutania Beach has 123 rooms in total, which expand in three 2-floor wings: a central and two side ones. Most have direct sea view, while others side sea view. 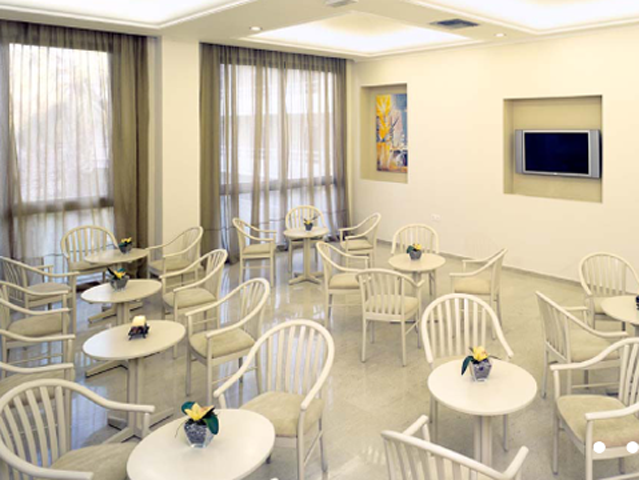 The rooms are divided into doubles, family rooms, Junior Suites and rooms with private pool. 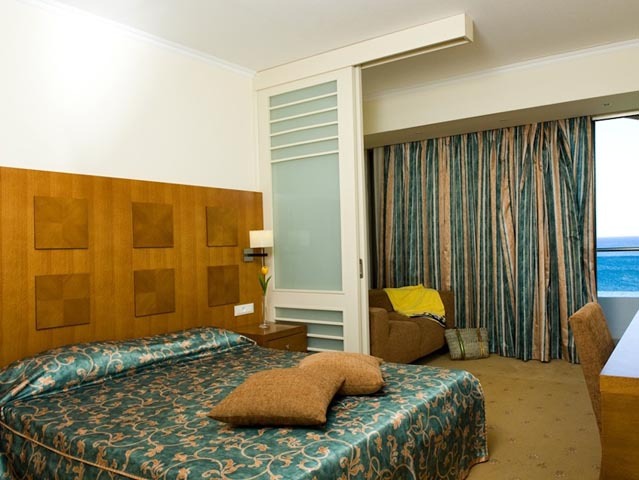 These spacious rooms feature a bedroom, bathroom with bathtub and a balcony or terrace, either with direct or side-sea view, pool view and garden view. Some have also a convertible sofa in a corner which is separated by a sliding door and can accommodate a third person. Special features include: satellite TV, telephone with direct international calls, air conditioning, fridge, hairdryer, music channels. 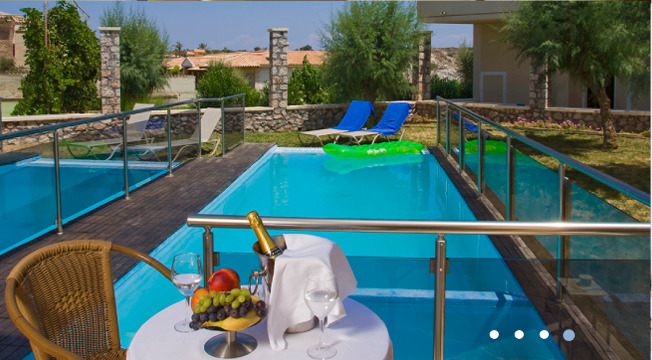 Ten out of the ground floor double rooms have a private swimming pool each and a large veranda. 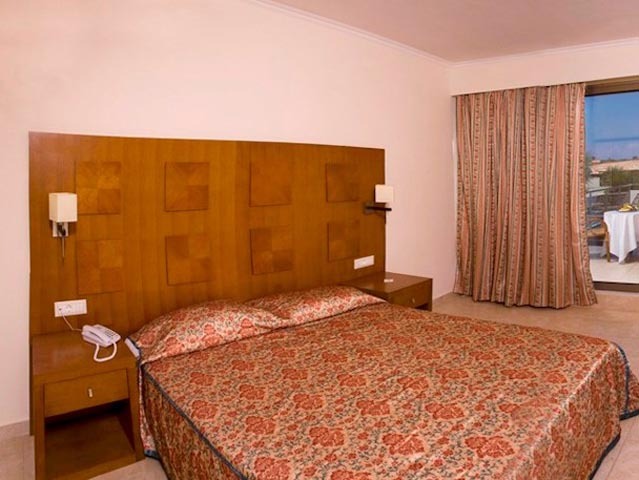 Each one of our double rooms can accommodate minimum 2 adults and maximum either 3 adults or 2 adults and 1 child (or infant). 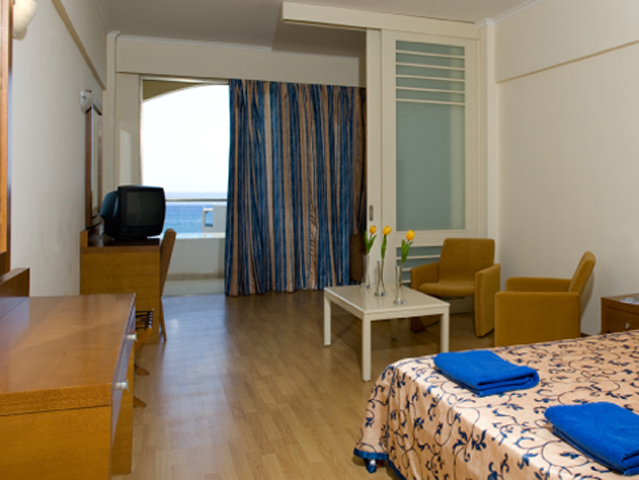 Family rooms are very spacious and larger than standard doubles, featuring a bedroom with seating corner separated by sliding door with sofa, bathroom with bathtub and a balcony or terrace with either direct or side sea view. Special features include: satellite TV, telephone with direct international calls, air conditioning, fridge, hairdryer, music channel. Each family room can conveniently accommodate families of 2 adults and 2 children (until 13 years old) or 2 adults and 1 child (and/or infant). 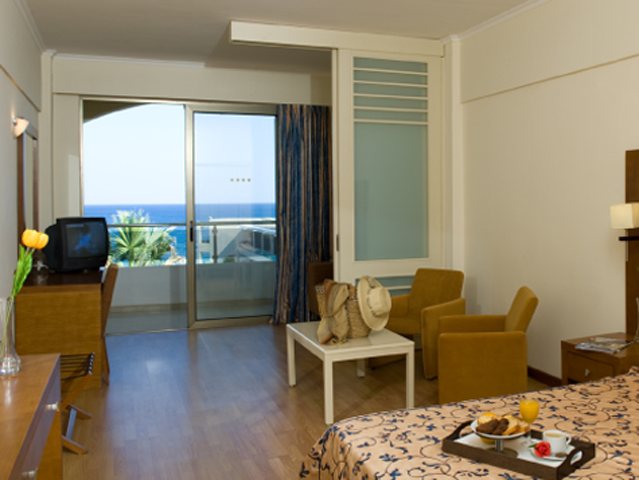 Junior suites are the largest rooms available featuring one single space with the bedroom and a cosy living room, bathroom with bathtub and a balcony or terrace with direct sea view and a panoramic aspect of the gardens and the swimming pool area. Special features include: satellite TV, telephone with direct international calls, fridge, air conditioning, hairdryer, music channel. 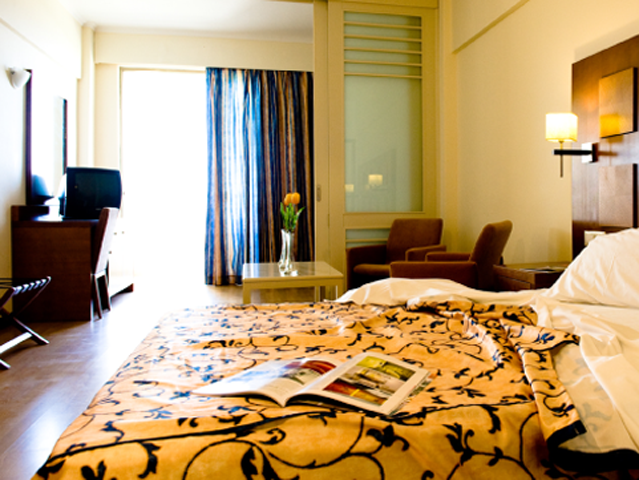 Each junior suite can accommodate minimum 2 adults and 2 children and maximum 3 adults and 2 children (or infant). Baby cots are available upon request in all room types. 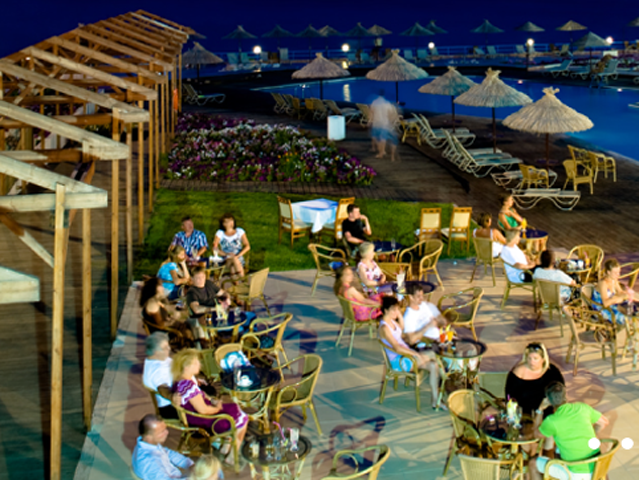 Lutania Beach hotel stands directly on Kolymbia beach.Kolymbia is a seaside resort catering not only for families and couples but also for groups of young people, who seek peaceful, relaxing vacation and nightlife as well. The road to Kolymbia, from the junction with Rhodes-Lindos highway, drives you through an endless alley of gigantic and lush green Eucalyptus straight to the beach. The hotels and resorts line up one next to each other along the coastline, yet all are well apart without causing feelings of congestion. Among them, lies a variety of local restaurants and handicraft shops for all tastes. Comprehensive tourism development in Kolymbia only started a few years ago, yet it has managed to maintain the area's natural beauty and also the traditional island ambience. Open: May - October . 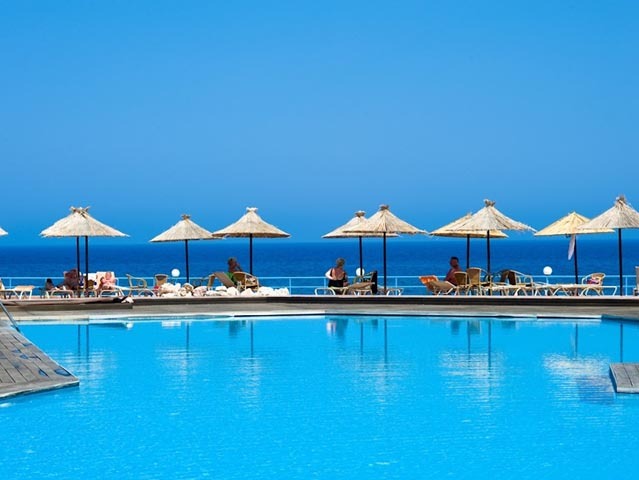 . . . . Our hotel is located in the area of Kolymbia, on Rhode's east coast, at about 25 kms south of Rhodes Town, on the direction to Lindos and close to the town of Afandou. 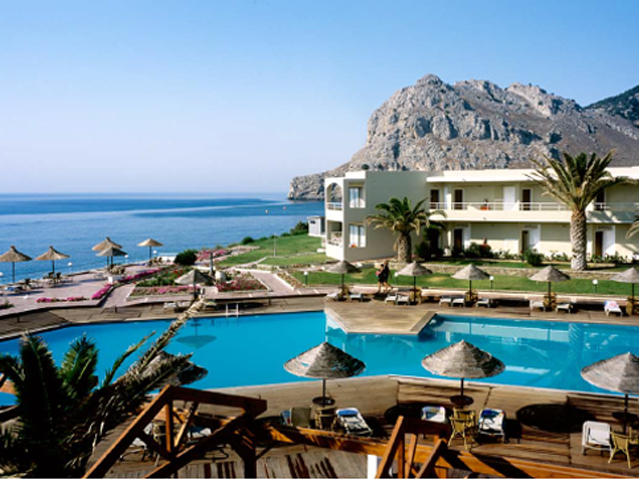 The location is exceptionally convenient, being halfway between Rhodes Town and Lindos, namely on the island's most popular tourist trail. 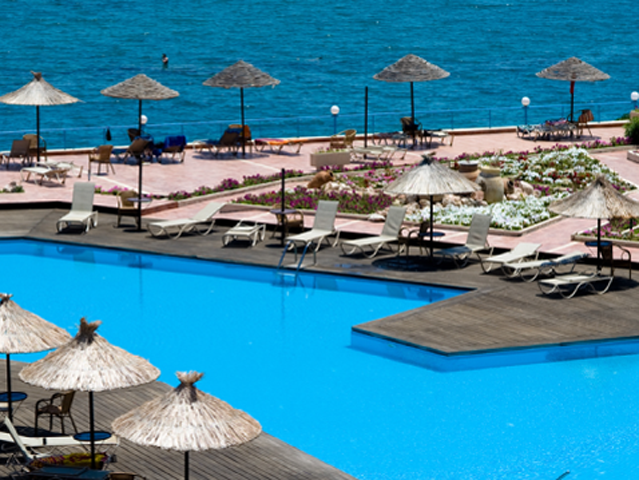 Situated within an idyllic natural environment, the hotel is surrounded by lush greenery and blooming gardens. 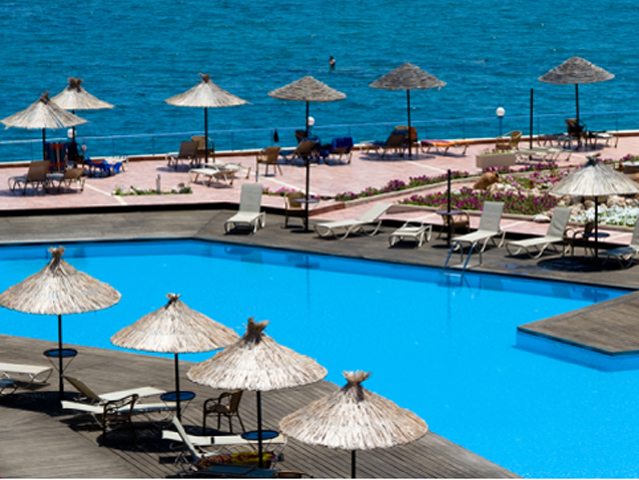 With the famous Monastery of Panagia Tsambika overlooking the endless pebble beach of Kolymbia Bay above the sharp rock in the background, Lutania Beach Hotel constitutes the ideal choice for perfect vacations!